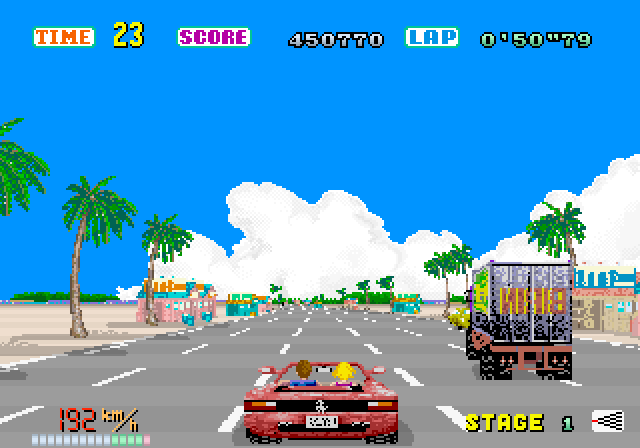 OutRun was an arcade game developed in 1980s by Yu Suzuki from Sega company. Yu Suzuki had always been a Ferrari fan and that's why a Ferrari Testarosa is a car a player jumps into and races against the clock in OutRun. It has been a huge success and quickly became a bestseller. As for the 80s it had fantastic graphics and gameplay. Sega quickly released a sequel Turbo OutRun, which turned out to be a success as well. Since that time, a lot of variations of OutRun have entered the market, including versions for Nintendo, PlayStation, Xbox and many others.